If It's Too Loud...: Stonefield - "Delusion"
Just when you thought we'd be tapped out of great Australian bands to bring you, along come Stonefield. 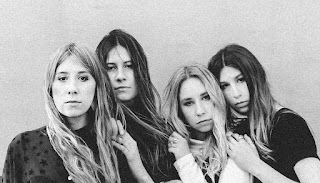 Consisting of four sisters (Amy, Sarah, Hannah, and Holly Findlay), Stonefield's newest single, "Delusion," is a bizarre blend of psych rock with some more mainstream elements. It's perfect for pych rock diehards that didn't get their fill with five albums from King Gizzard & The Lizard Wizard last year, but there are some more folk friendly late Beatles-esque vibes in there, too. That's not to say their sound is light and poppy, because it borders on old school Black Sabbath psychedelia, too. Like I said, it's a bizarre blend. You can listen to "Delusion" below. You can get your copy via Flightless Records here. For more on Stonefield, check out their website. Their current tour dates are below the video.